Legally cultivated in Turkey, Australia and India, Papaver somniferum L., or opium poppy, features white, red, pink or purple flowers. Narcotic latex, used to manufacture opium, morphine and heroin, is a milky substance in immature seed pods. The mature seeds, however, are non-narcotic; these seeds and their oil are popular baking and cooking ingredients. The oil is also processed into soaps and paints. 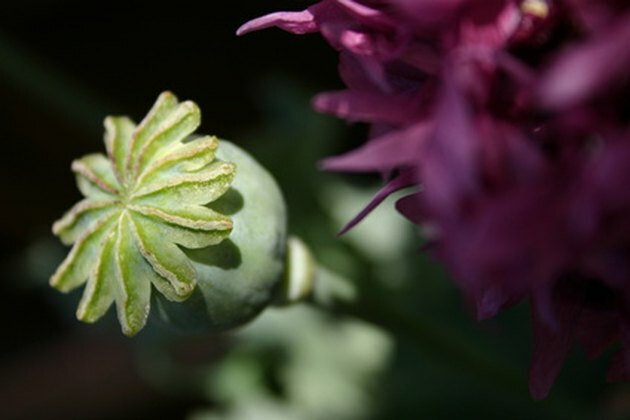 Opium poppies are legal to grow in the United States, but only as regulated food ingredients. A field of red somniferum, or opium, poppies. The elka poppy gets its name from Slovakian folklore. 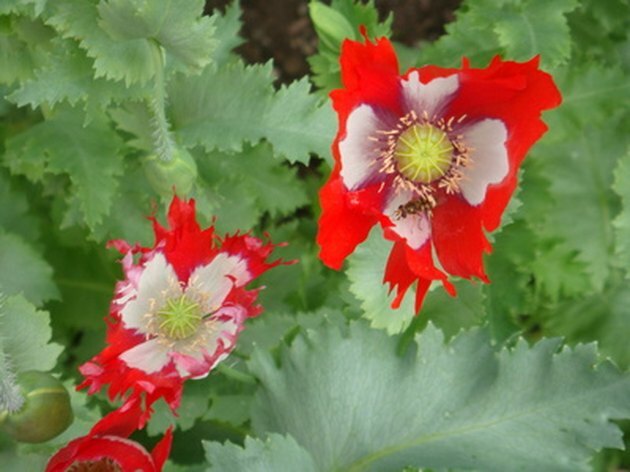 Native to Slovakia, the Elka poppy is named for an Slovakian woman who grew the flowers, reports Washington State University. The seeds of this poppy are white, and the plants produce white flowers with lavender to purple centers. The oil is sweeter than that processed from black seeded poppies, and is considered one of the finest edible oils in Europe. The seeds are prized for the nutty taste they add to baked goods. This heirloom pepperbox poppy features dark marks on the petals. 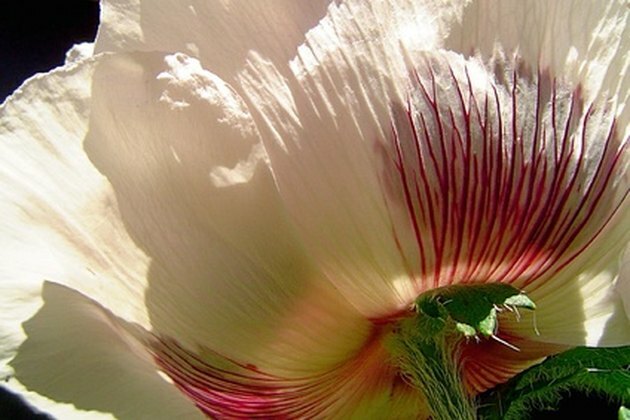 The heirloom pepperbox poppy is an annual to biennial plant that grows to about 3 feet tall. The flowers are delicate, and can vary in color from pale pink to red and deep purple with darker center colors. The tiny seeds produced by this poppy are a deep blue-black and are most often used in breads, pound cakes and salad dressings. Bright red Danish Cross poppies. The Danebrog, also called the Danish Cross, Danish Flag and Victorian Cross, has brilliant red petals with pure white spots at each base, forming an easily identifiable cross. 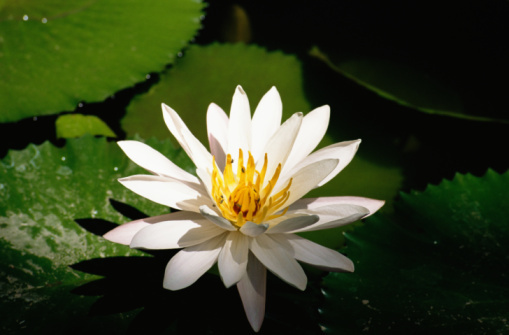 Each bloom can grow up to 5 inches in diameter, and the edges of the petals are fringed. Florists use the seed pods of this poppy in floral arrangements, and the seeds are also used in cooking and baking. 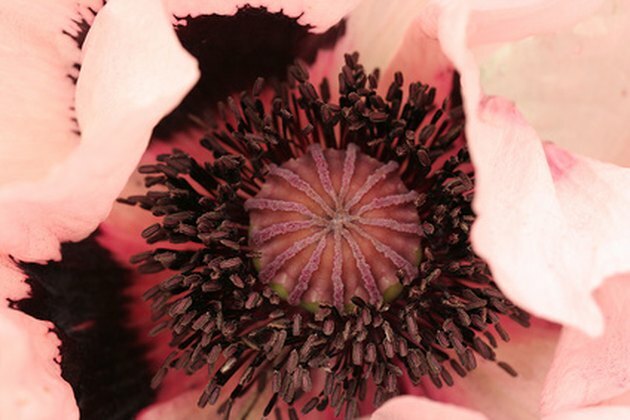 The deep purple color of this poppy helped influence its name, which is formally 'Black Cloud Peony Papaver'. The black cloud will grow as either an annual or biennial plant. 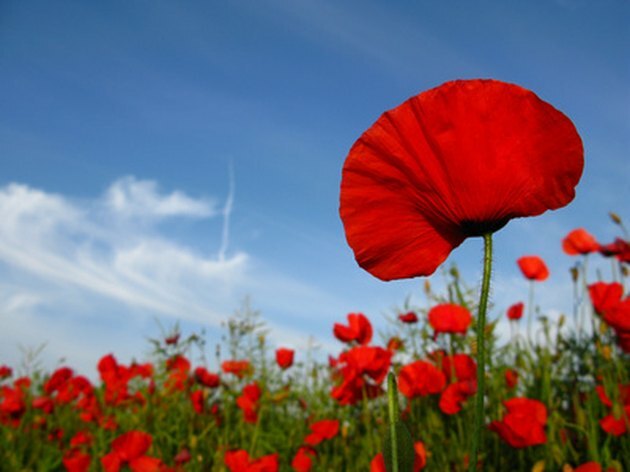 One of the larger poppies, this plant can grow to a height of above 4 feet on a thick stem, and usually blooms in June. The flowers are large, reaching a diameter of up to 6 inches.